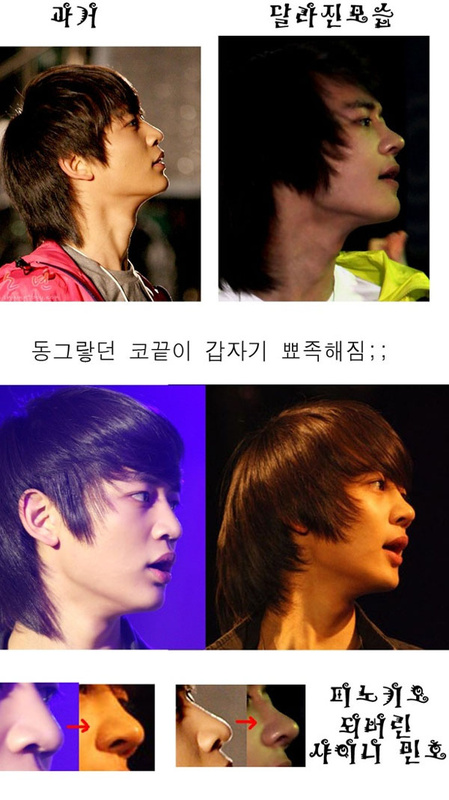 MinHo’s nose had looked noticeable different, or rather pointier than before. Personally, I don't give a damn if he had plastic surgery. It doesn't make him less talented. Netizens are not talented, that's why they basically stay online 24/7 debating on unimportant things. Eww, I like his old nose. and she was only 13? SHINee's music will still be the same anyway right? ^^That's right, trelayda. He looks different on the outside, but I'm sure he's the same person on the inside. I gotta admit eventhough neitizens have no life they do have a point about he's too young to go to plastic surgery, and 2nd his nose was cuter before. That doesn't make me hate him or think less of him. His my fav in the group and I still find amazingly talented. Yeh, but that is not the question, no? The question was: did he need the operation? did a seventen-years-old boy truly need a nose job? What kind of parents would let their child "fix" his face in order to become "hotter"? And what kind of enterprise will make it's youngest worker have a medical invasive procedure just for the sake of a boyband? Besides there is the fact that he is a still growing boy. Is quite obvious he was still an attractive boy before the surgey. What if the "wrong" nose would fit in perfectly harmony with his future natural face, a fully developmented one. I think that for once Netizens hit a good topic: what is allowed to do on an underage kid, contrat or not. Or even more, what use plastic surgery has for people without medicals issues. Are they going to fix low self-esteem problems, are they going to fight nature and age or they will stand for unnatural (literaly) and narrow beauty standards? We don't know if Minho decided to get plastic surgery himself, or SM made him. I heard that it's common for underage Koreans to actually get plastic surgery. I'm NOT a supporter of plastic surgery. But, I can't judge a person for actually going under the knife. It's their life, let 'em live it. Though, I get the feelin' that Minho was the one who decided to get a nose job. I mean take SNSD's Yoona for example. She's not the prettiest girl in the world. She's a plain jane, but she NEVER went under the knife. If she did, that proves SM makes all his artists get plastc surgery. Anybody who says that she did get plastic surgery, just compare her younger photos and pre-debut pics, with pics of her now-she looks the same. When she does radio shows, I usually see her in a sports jacket, jeans, a ponytail, and hardly any make-up. That's shows she's comfortable in her own skin. I guess Minho has low self esteem issues. SORRY. It doesn't make him less talented, remember that. About SM...well, things are complicated here. For once, I don't think they just bluntly say him "Well, here is the cash and the number of Dr. ... (insert name of creppy korean doc here) You have two days for recuperation". But I do believe that they put a huge amount of pressure, not only him but others trainees/young stars, to be "perfect". Perfect by nature or by knife it didn't matter how, but he needed to be another beauty in the market. So, in my opinion they just put the pressure and the talking about others "brilliant results" no mention what really means to change your body for other's enjoyment. Yoona seems brave and full of confidence in herself, which is amazing and it makes her the ideal kind of person for the job. But frankly: how many of these boy&girls are inestable and with lots of issues. So, maybe they are who make the ultimate decision, yes, but behiend them is a huge machine of pressure and violence (yes violence, because something that is so intolerant and narrow produces violence) which is taking adventage of them. I don't think SM is "the big meane" of the movie. After all, surgery seems to be wide accepted in korean society (from the news that came, I'm far from to be an expert ashamed4:), But on a boy? I mean, SM, his family, the government, SOMEBODY would say no? Is not a tatto or the kid asking permisson for cigarrettes. It is something that has no return. They just let him be..? 17 years old is considered an adult in South Korea, right? Correct me if I'm wrong. If it's true, then he has the legal consent. Yes, pressure and violence are present. Then again, what do you expect from a cutthroat world, like showbiz? They put themselves there, so he's going to HAVE to go through all the bumps in the road. Nothing is easy in life. If he wants to go through his career lookin' like Pinnochio, and being scorned by people-he HAS to deal with it. Yeah, in the USA you're an adult when you reach 18 years old. Heck, you can't even get plastic surgery if you're under 18-unless if you were disfigured in an accident or somethin'. they both look the same to me..
An nose job surgery is the best for making improvement of nose condition related to it size and shape. These improve overall appearance of the nose and helps us looking more beautiful. Check these site nosejobguide.com for more information.